This month's column is on antennas again. I normally don't write about antennas twice in a row, but this topic kind of fell into my lap recently. As the ARRL Antenna Book says, linear loading is "little understood" alternative to inductive loading. It is, however, one that can be put to good use in many situations. A couple of years ago, I homebrewed a "Cobra" antenna (https://www.kb6nu.com/yet-another-new-antenna-the-cobra/). It's a doublet antenna, meaning that it consists of two elements connected to a center insulator, where it connects to a feedline. The unique thing about the Cobra antenna is that each element consists of three parallel conductors connected in series. My antenna uses a lightweight, three-conductor rotor cable that used to be available from Radio Shack. The feedline is 450 Ω ladder line that connects to an antenna tuner to give me multi-band operation. Connecting the conductors in this way is is supposed to provide "linear loading." Somehow, running the conductors in parallel is supposed to increase the antenna's effective length. My antenna is only 73-ft. long, but it easily tunes up on 80m. The ARRL Antenna Book has a short section on linear loading. It says that linear loading is a "little understood" alternative to inductive loading that can be applied to almost any type of antenna. Furthermore, "...it introduces very little loos, does not degrade directivity patterns, and has low enough Q to allow reasonably good bandwidths." As I mentioned, I've been using this antenna with good results for a little more than two years now. When I first put it up, someone mentioned the concept of linear loading to me, but not being an antenna guru, I didn't 'give it much thought. About a week ago, though, I ran across a link to the page Short Ham Antennas for HF (https://www.hamradiosecrets.com/short-ham-antennas.html). That got me thinking about the topic again. 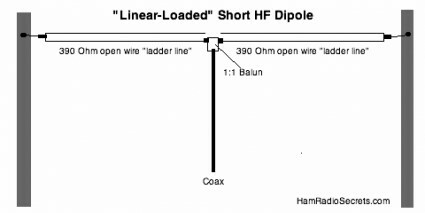 This page describes a way to build a linearly-loaded dipole antenna with a feedpoint impedance of approximately 35 Ω. This allows you to feed it with coax instead of the ladder line that I use. The author uses 390 Ω ladder line for the elements. He says it's commonly available, but I don't think I've ever seen 390 Ω ladder line. You could probably use 450 Ω ladder line by adjusting the element lengths a little. At that point, I started Googling. The next linear-loaded antenna design that I ran across is a design from M0PZT (http://www.m0pzt.com/40m-linear-loaded-dipole/). He built his elements from some sturdy wire and homebrewed spacers made from PVC pipe. He's used this design for the 40m elements of a fan dipole covering the 40m, 20m, 15m, and 12m bands. Only the 40m elements are linear-loaded. I also found a design for a linear loaded vertical antenna for 40m and 80m (https://www.qsl.net/pa3hbb/ll.htm). This antenna is only 7.736m, or 25.4 ft. tall. Of course, it requires a good radial system to work well, but it will work a lot better for DX than a low doublet or dipole. Finally, there's an eHam discussion on linear loading (https://www.eham.net/ehamforum/smf/index.php?topic=84418.0). Unlike a lot of eHam discussions, this one is quite civil. It's worth reading if you're interested in the topic. So, if you're thinking of getting loaded, errrrr, I mean loading your antennas, here's a method for you to consider. It works! Dan Romanchik, KB6NU, is the author of the KB6NU amateur radio blog (KB6NU.Com), the “No Nonsense” amateur radio license study guides (KB6NU.Com/study-guides/), and one of the hosts of the No Nonsense Amateur Radio Podcast (NoNonsenseAmateurRadio.Com). His wife sometimes thinks that amateur radio has become too much of a habit for him.